Stacie sent me a Valentine’s gift! Isn’t she lovely? 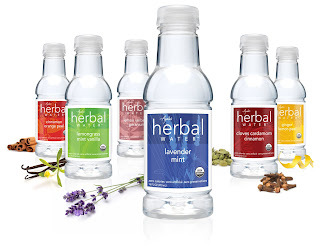 She and the people of Ayala’s Herbal Water sent me a sampler (6-pack) of their all-natural, organically flavored water. I do not normally drink flavored water because I really dislike artificial sweetener, but Dr. Ayala’s water doesn’t have anything artificial in it. The flavors are sophisticated, complex, and fun. The package came with a handy tasting guide, so I sat at my dining room table with the bottles lined up in the recommended order and a shot glass, which I keep at hand for such occasions. Ginger Lemon Peel: This had a light, crisp flavor. A tad bitter, but clean-tasting. I imagine this would be my “reading in the sunshine” choice. Buy Now for $24. Lavender Mint: Bliss! The lavender was really light and the other herbs so very refreshing. This is my “relaxing in a bubble bath” or “replacing my evening tea” flavor. Buy Now for $24. Lemongrass Mint Vanilla: Again, the mint and lemongrass are refreshing, and the vanilla smooths and balances it out without overpowering the other herbs. My choice for every day refreshment. Buy Now for $24. Lemon Verbana Geranium: I would call this a very sophisticated choice. Aromatic. It was distinctly “herbal” in taste. Ayala calls it the best palate cleanser of their flavors. Buy Now for $24. Clove Cardamom Cinnamon: You have to try this one. It’s a bit beyond description. A little spicy, a little sweet, a whole lotta delicious. Not overpowering, extremely enjoyable. This will also replace tea in the evenings for me. I can’t believe this has no calories. Buy Now for $24. Cinnamon Orange Peel: Citrusy with tiny hint of cinnamon. A good workout or sitting-by-the-pool pick. Buy Now for $24. I am excited to order more of my favorite flavors- I never knew water could be so delicious. Check Ayala’s website for local availablility, or order it online from my Open Sky store!